Take a break from your double-digging and bush whacking to do some easy, nip and tuck, maintenance on houseplants. Did your houseplants get a summer vacation? Hot summer work on the vegetables, flowerbeds, lawn, and shrubs can leave little time and energy to spend on your "indoor gardens gone outdoors." Now may be a great time to overhaul those plants: pot them up, pot them down, give them a different look. A lovely fall day is perfect for puttering with your potteds. Gather a bunch of plants in a shady spot, and round up all your stray empty pots and assorted baskets. We're going to do some mix and match, some plant alteration and rejuvenation. We'll end up with a fresh new assortment of plants to come in and brighten the indoor garden. A picnic table in the yard is my work (play) area. Easy cleanup! A large plastic bin holds a supply of soil and catches my peaty dribblings as I work. Plants can grow so quickly when they're happy. Here's a Schefflera that responded well to being outside under a maple tree for the summer. Early in the season, those umbrella-like leaves were catching every breeze. It kept blowing over. I set its plastic pot inside a larger clay pot for some weight, looks and stability. 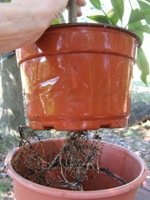 Months later, the growing plant sends rootlets out through the drainage holes of the plastic pot in search of more water. If he could talk, he'd be begging for a bigger pot. He's getting moved to another pot that's just about an inch bigger all around. Some tropicals, like Spathiphyllum, get bigger by adding side shoots. When those plants overflow, you could opt to remove some of those offshoots and pot them as a new plant. Then add fresh soil to replant the original specimen. Who doesn't have a wandering jew or golden pothos or philodendron, all grown for their graceful trailing stems? At times, those graceful trailers turn into gangly strings with a dab o f green at the end. (Imagine the unfortunate resemblance to a cat toy.) These need to be trimmed off. 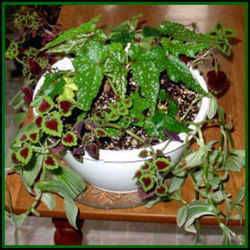 Inch plants and others will fill out on top by starting new stems where leaves are attached. Don't feel guilty chopping off the greens--they're salvageable. Leave a few inches of bare stem and root those stems in a vase of water. 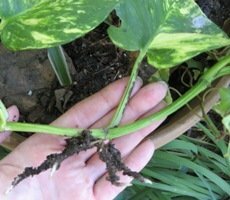 Long healthy trailing stems? 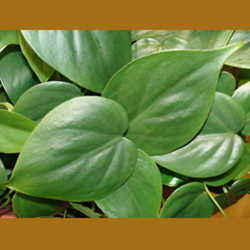 Some like Pothos, can be cut into sections, each having one leaf with stem and root bud, and planted. A bunch of those done in June can give you a bunch of nice plantlets by September. "C'mere, you won't feel a thing." What if the specimen still looks just right in its pot? This won't hurt a bit- pull it out and check down below. You might be surprised by a solid mass of roots. That plant would really appreciate a slightly larger pot and fresh soil around those roots. Doesn't that sound better than having its fine rootlets crammed up against that clay pot? "Here baby, spread those roots." 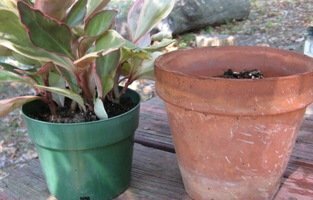 There's another good reason to pop a plant out of the pot and take a look, especially if you have let your plants take a summer vacation outside. I'm just guessing here, but I think you'd like to be sure you aren't bringing an army of ants, or even one earwig, into the house. I rarely find that bugs have taken up residence in my potted plants but still... I'd much rather be able to drop the pot and run, than find out later that some six-legged horror came in with the ivy. Are those the odds and ends of your last plant swap, or some garden center refugees? 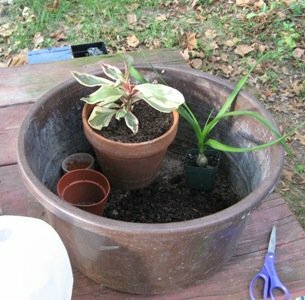 Let's get them out of temporary quarters in the cheap nursery pot, or yogurt cup, and into cuter containers. Trust me, you'll feel better about stuffing the windowsill full of plants when the pots are attractive. You could at least try to match the cheapo pots to a basket or mug. 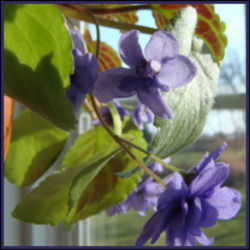 The plant can be lifted out for watering, or easily swapped around to change the look. Make all your little plants into a big one, instantly, in a combination planting. It'll be easier to maintain than so many small pots needing frquent attention. 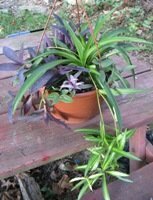 A Hawaiian Spider contrasts well with Purple Heart, and a small leaved Inch Plant adds another texture. Another way to deal with your numerous little plants is to set a large, leggy plant into a slightly oversized basket and then place some smaller ones around it. When you water the small plants, they drain into the large one. A tall Dracaena or banana plant would work well for a base. Baskets and cuttings and pots! Oh, my! Let me warn you, things can get a little crazy. Once you start shuffling plants, and making little ones from big ones and vice-versa, you can get kind of confused. Possibilites proliferate, matching up the perfect plant with container and matching the plant and container to a shelf or table in the house...well I have to admit, I love playing with plants and can get carried away. Just don't let your plants tell you what to do, and you can multiply your houseplant options. "Non draining containers" in the text is linked to the article "Non-Draining Containers: Watery Tombs for Seasonal Plants" by Jeremy Wayne Lucas. Here's a recent article about Wandering Jews by Jeannette Adams. All pictures are property of the author. Mott, Russell C. The Total Book of House Plants. New York, Crown Publishers, 1983.